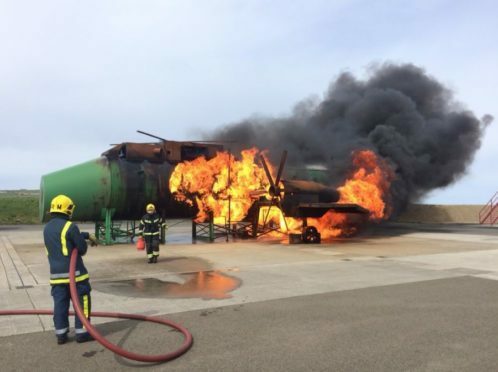 Firefighters in action at Kirkwall Airport. A Highland MSP has praised the “sacrifice” of retained firefighters serving in rural areas – tabling a motion at the Scottish Parliament recognising their devotion to duty. As dozens of retained crews yesterday continued to battle a series of wildfires across the north, the Skye, Lochaber and Badenoch MSP Kate Forbes said she was “amazed” by their commitment. Inverness has the north’s only full-time fire station, meaning that rural stations such as Dingwall, Drumnadrochit, Dunvegan, Fort William and Kingussie all rely on retained firefighters. Miss Forbes added: “I recently met and spoke to retained firefighters and was amazed at their level of commitment and sacrifice. “To my shame, I had not fully appreciated how much time and effort that retained firefighters devote to training and responding to emergencies. The MSP said: “Their employers and families enable them to drop everything and respond to emergencies. “The pager can go at any time of the day or night. “At the same time, retained firefighters train regularly so that they can rush to anything from a faulty alarm to a road collision. It has been supported by more than 30 cross-party MSPs.